Hamilton is a musical about Alexander Hamilton, one of the USA's founding fathers and, by all accounts, a jolly good egg. 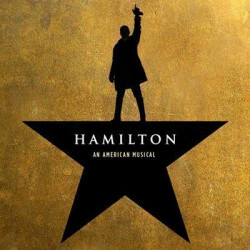 The show's music, lyrics and book come from the talented Lin-Manuel Miranda and the plot is inspired by the excellent 2004 biography of the great man by respected historian Ron Chernow. The results have wowed critics and audiences alike. The musical made a star-studded Off-Broadway début at The Public Theater in early 2015, where it sold like hot cakes and almost caused riots as people desperately tried to buy tickets. It soon won the 2015 Drama Desk Award for Outstanding Musical plus seven more Drama Desk Awards. After transferring to Broadway in August 2015 it sparked even more critical acclaim at the Richard Rodgers Theatre. The show's advance box office sales were record-breaking stuff. It has gathered a coveted Grammy Award for Best Musical Theater Album and a Pulitzer Prize for Drama, and has been nominated for an all-time record 16 Tony Awards. Wow. Miranda worked extremely hard to create a host of show tunes you won't forget in a hurry, including the splendid Who lives, who dies, who tells your story. 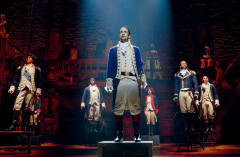 Lin-Manuel Miranda, who also stars in the show, was nominated for Best Actor, Best Book of a Musical and Best Score of a Musical, and the cast won seven nominations across four acting categories, beating the record 15 long held by The Producers and Billy Elliot. Hamilton is already a national sensation in the USA, and it's completely sold out over there until the end of 2016. Apparently the US presidential candidates Hillary Clinton and Bernie Sanders love it, as do the Obamas. Michelle Obama praised it to the skies, insisting it was, “the best piece of art in any form that I have ever seen in my life”. Barack Obama called it an “incredible musical”. The cast album was streamed online by literally millions of Americans. And all over the nation people are singing those tunes at work, at home, in the streets. Seldom has a stage musical scored such a massive hit with people of every age, gender and race. Premium tickets were on sale for over five hundred dollars at one stage, pricing many audience members out of the market completely, and tickets on the Black Market were, apparently, going for three times that much. The show's Daily Lottery for ten dollar tickets was so badly over-subscribed the lottery website crashed. All of which means this is probably going to end up one of the shows of the decade, and it's already being eagerly awaited in London's West End. 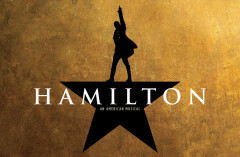 Want premium, full price or discount Hamilton the Musical tickets? 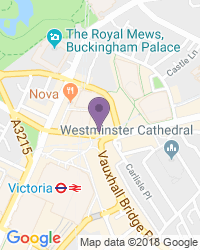 We always have great availability and you'll enjoy excellent value for money on the complete range of ticket types and seats, cheap to top of the heap. With the imminent transfer of Broadway mega-hit musical HAMILTON to the West End if feels like we’re gearing up to something extraordinary. Co-producer Cameron Macintosh has even kicked long-running hit BILLY ELLIOT out of the Victoria Palace Theatre and virtually rebuilt it to house the show and this week the press was full of stories about how hard or difficult it is to book tickets, depending on the experience of the writer. How does one even attempt to review HAMILTON? In the United States the show has become a theatrical phenomenon unlike any I have experienced in my forty years of theatergoing. 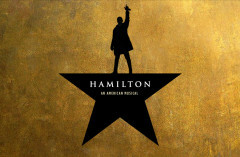 It has won 11 Tony Awards including Best Musical, the Pulitzer Prize, has hundreds of teens attending its weekly Ham4Ham concert outside the theatre’s stage door and can command thousands of dollars per ticket for a prime orchestra seat. I was in New York recently and decided to check out the smash hit musical Hamilton to see what all the fuss is about. No chance, I pulled every favour I could but no one could get me a ticket, the production is booked up solidly for at least the next year. But they do a daily on-line lottery. You have to register by a certain time and at 4pm you get an email letting you know if you've been successful or not. I imagined if I tried that every day for a week the odds were I'd win a ticket, I mean, how many other people would apply that much determination? Wrong again. 4pm brought disappointment every day. Use the search box at the top left of this page to search for Hamilton tickets availability.